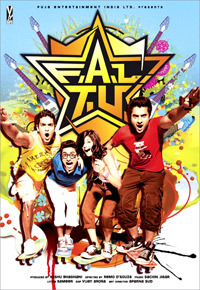 Bollywood Dil Se Movie Review:F.A.L.T.U. F.A.L.T.U. as obvious from the promos is very much inspired by Accepted (2006, I remember the movie tickled my funny bones).The movie marks the debut of Remo as a bollywood director. (He has a Bengali film in his bag as director).I had quite low expectations from the movie though the music was awesome(check out its review in this blog). But I must say i under rated Remo. The movie is total-fun. The first half of the movie is as smooth as the original one. Funny dialogues, rich cinematography and sizzling star cast (yes the actress is charmer). The problem starts in the second half. The movie loses its pace here.Screenplay gets quirky. Some meaningless melodrama here and some unwanted sequences(the film could have been tighter by 10 minutes). By the mid of second half I thought that the attempt is not honest.The sudden transformation of genre from comedy to drama is a bit jerky. But all this complains came to an end as soon as the climax arrived( thanks to the ace choreography by Remo, something world class!). In last 10 minutes you feel that the effort by Remo is honest and honest enough to overtake the original movie.You cant manage but smile in the end when you leave the theatre. Not to forget the tremendous audience response at the theatres(commendable as the world cup fever is on). If the world cup trivia and more hyped (GAME) was not the hurdle, the movie would have been a super hit for sure.Lets see how far it can go now. Frankly the concept(though copied) is better than 3 Idiots (I personally find the movie over ratted).One should see it for sure. Youthful and funny.Enough to describe the cast.Jacky and pooja sizzle on the screen.Chandan Roy Sanyal is brilliant again(as in Kaminey).This boy will rule here for sure. Arshad warsi as google(metaphor-the person with all the solutions, i doubt why many reviewers failed to understand that) is gracing.Riteish Deshmukh as Principal Baaji Rao is a bit loud. Not much to credit here as the story and screenplay at an extent(Mayur Puri who has more flops than hits) is not original.Some bollywood tadka to story is okay. The editing as i said could have been tighter.The over exposure of the official website was something kiddish.Again First half is brilliant and second half is okay.Film is shot with good different angles. And locations especially the college is exotic.Songs are shot very well(looks Remo's influence here). The best soundtrack in recent cinema. As i repeatedly mentioned in music review, the soundtrack is perfect for Background Score. And the same thing is done here by very talented Sachin - Jigar (with musical Teree Sang on their credit). The average songs like Awaaz do and Percentage is exceptionally placed well in the movie. As mentioned, The direction is good as compared to other choreographers turned directors (Ganesh Acharya, Farah Khan and likes) but he has still a long way to go. Nevertheless a good effort. So F.A.L.T.U. is definitely not a faltu movie and should be enjoyed by one and all.